On Wednesday, Sept 5, the brand new DSU instructor, Emily Pieper, kicked off the first meeting of the new and improved Theatre Club. 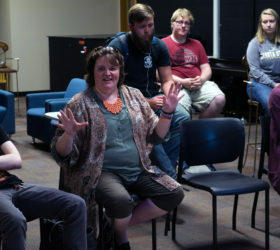 Past members and potential recruits came together at the TC Underground to learn about the recent addition to the teaching staff and the coming changes to the theatre program. Originally pursuing a position here as an adjunct professor for speech, Pieper (pronounced like peeper) seized the opportunity when she learned DSU had a theatre position to fill as well. Her major in college was English Education with a focus in Theatre, and while she’s spent about the last 12 years as a stay-at-home mom, she also has years of experience in her community theatre, where she has helped with programs ranging from children’s plays and family programming to greeting card making and knitting classes. Along with her broad experience, Pieper brings a blank canvas and a very open mind; she’s stressed that this will not be your cookie cutter drama club experience. 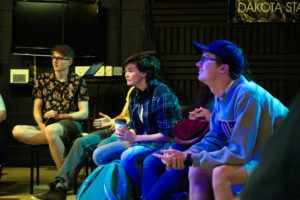 She hopes to “bring life into the theatre,” and ideas for club activities include miming, improv, puppetry, Broadway, and even virtual-reality theatre. 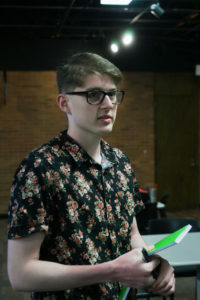 Pieper is excited to make a name for DSU Theatre among more established schools, stating that the group can find their niche and make it amazing. The first projects of the refreshed Theatre Club will be a workshop session for a production of Mary Shelley’s “Frankenstein” and preparing for the seasonal haunted house this autumn. Anyone interested in joining the Drama Club can either email Pieper or stop by her office at Beadle 222, though you’re also likely to find her by Einstein’s.